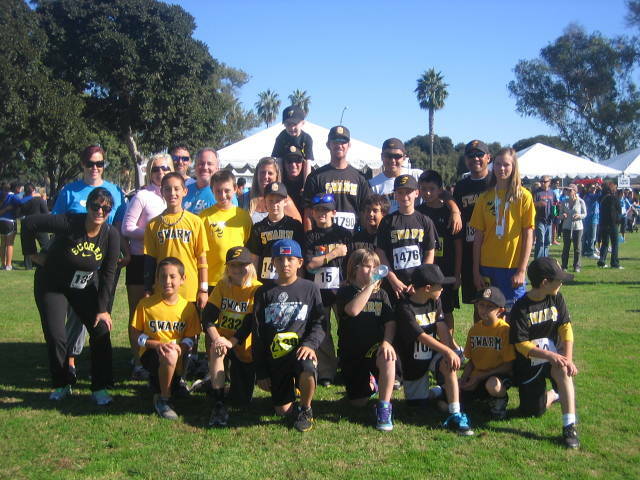 San Diego Swarm Baseball Academy understands the impact cancer can have on a child and their family. We want to do our part to help make a difference to those in our community. Swarm Team with the most donations will win a $100 pizza party! Overall, it was a fun and important morning to further the Swarm's mission to instill the importance of community service in its players - Sportsmanship, Leadership, and Citizenship. The 9U Swarm joined 60 teams and over 700 other baseball players throughout San Diego county to play baseball and raise funds for the Chelsea King Memorial Scholarship. The tournament was hosted by Triple Crown Sports. In Chelsea's memory, the Swarm worn sky blue wristbands (Chelsea's favorite color). The perfect day for baseball was highlighted by a heart-pounding 6-5 victory over the Murrieta Redhawks. In the bottom of the last inning, after Griffin Catarius stole two bases after drawing a two-out walk, Eddy Corlett lined a two-strike single into right field to bring home the winning run! Overall, the tournament was fun and exciting, but more importantly, it raised awareness and money for an incredible cause. The Swarm is honored to be a part of the Chelsea King Memorial Scholarship Tournament. The 9U Swarm starts their community service commitment early. 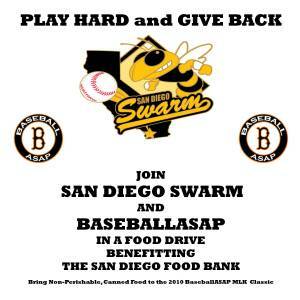 The team has partnered with BaseballASAP to host a food drive benefitting The San Diego Food Bank at this weekend's BaseballASAP MLK Classic in Lakside. Teams are encouraged to bring non-perishable, canned food that will be donated to The San Diego Food Bank after the tournament. The Swarm tradition of community service continues! 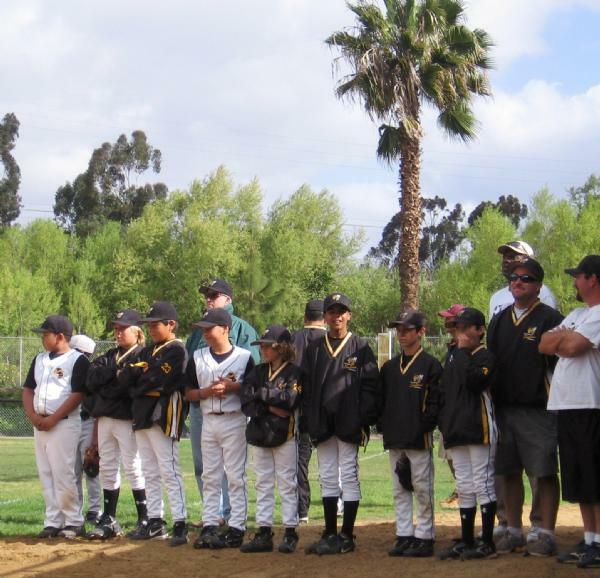 April 5, 2009 - The Swarm Baseball Academy hosted its 3rd Annual Baseball Clinic. This year the Swarm provided the clinic for The Scorpions, the softball team of the San Diego Center for Children. The Scorpion players range from age 5 to 12. As is tradition, Swarm players taught Scorpion players fundamental baseball skills consistant with the clinic theme of "kids helping kids." The Swarm was excited to be able to share their experiences with fellow baseball enthusiasts for an afternoon of fun. The Swarm wishes the Scorpions all the best in their season! 2nd Annual Giving Event for the San Diego Center for Children on December 14th. The event was heartwarming and exciting for all who attended. the San Diego Center for Children's recreation programs! THANK YOU to all the Swarm players and their families as well as friends of the Swarm who came to the Center to help make Christmas a little brighter for the kids who received our gifts. You can still make a donation to the San Diego Center for Children or to the Swarm fundraiser to help our players participate in the year-end Cooperstown tournament in New York. 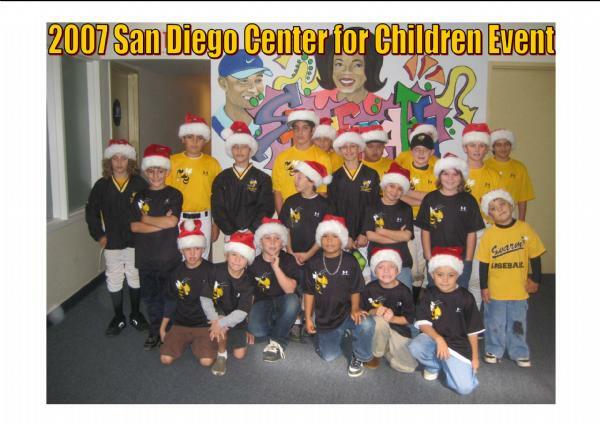 Checks are made payable to San Diego Swarm Baseball Academy and are all tax deductible. After a two-week delay due to weather, The Swarm held their 2nd Annual Baseball Clinic for the Shetland Division players (ages 4 to 6) of North City Youth Baseball. This year again the unique aspect of the clinic was that the Swarm players provided the instruction to the younger players. Swarm coaches provided only supervision. This year the 11U Swarm players were assisted by the 8U Swarm players in teaching the fundamentals of hitting, fielding, throwing and base running. In the organization's continuing effort to promote citizenship, leadership and sportsmanship in it players, The Swarm will continue to focus on community service projects that assist children in San Diego County. On December 9th, The San Diego Swarm participated in their second community service project of the year as they distributed sports equipment to the children (ages 5 to 12) at the San Diego Center for Children. The equipment will help the Center start recreation programs for their residents. 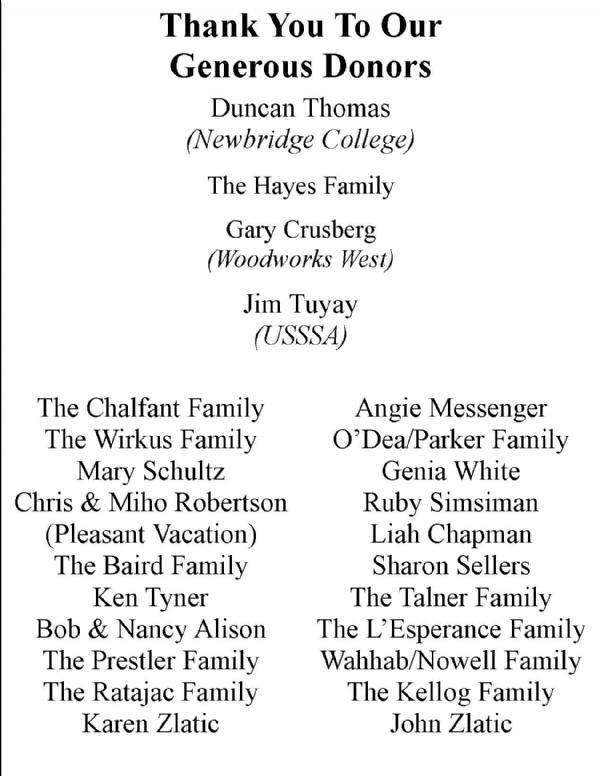 It was a memorable event for everyone involved. The Swarm's stated mission is to not only play baseball at a high level, but to give back to the community. The Swarm will continue to find ways to help further the futures of children in San Diego. The Swarm was honored to play in an exhibition game yesterday on the 60th anniversary of Jackie Robinson's Major League Baseball debut. The game was played at the Jackie Robinson Family YMCA. The Swarm dropped a 10-7 game marked by sloppy defense on both sides. In spite of the loss, the Swarm players received alot of instruction and had many laughs as Lenny Randle and other former and future Major League players conducted a great clinic for all the players. It was a fun day for all the families. 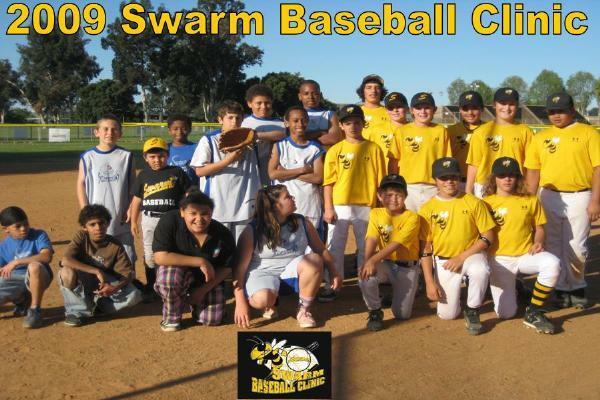 The first annual San Diego Swarm baseball clinic was held on February 10 at Mt. Etna Park for North City Youth baseball players 5 and 6 years old. It was a tremendous success as 60 players came out to take part in the event designed as a community service project aimed at giving back to the league most of the Swarm play in on a regular basis. The Swarm players were responsible for most aspects of the clinic, and they did a terrific job teaching baseball skills and communicating with the attendees. Quite an accomplishment for a very mature group of 9 and 10 year olds! The event was covered by KUSI television and supported by North City President Donna Clark and many members of the league Board of Directors, the Swarm families and over one hundred parents and grandparents in attendance. The Swarm mission is to play baseball at a high level while promoting and demonstrating leadership and citizenship in the community and on the field. The team is on a small break while it's players get settled on their recreation teams at North City and Mira Mesa. 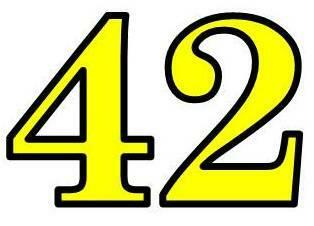 We will begin playing some games again in early March as we get ready for tournaments ahead in the spring and summer. 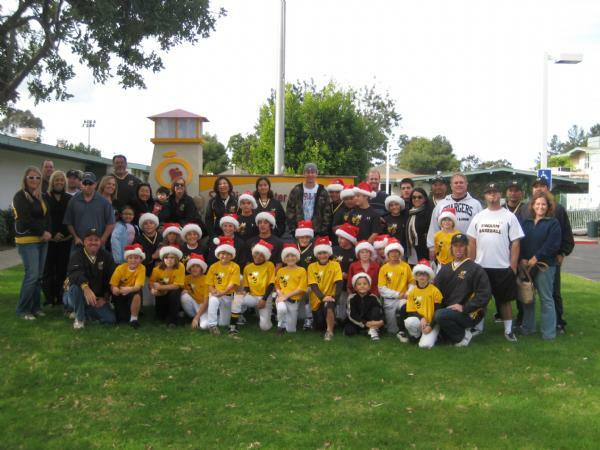 See photos of the San Diego Swarm Baseball Clinic under Photo Albums.